ANGEL TO DEVIL IN 10 SECONDS FLAT! I finally remembered to sit down on a Monday, to write an inspiring message. Um, NOT! I have to admit, it was reading the last bit of the Sunday paper on Monday morning, that inspired me to rise off my half asleep behind and get to typing. I saw this ad and had the best morning laugh. Now this is GREAT! This brings me back to the Pet Bereavement class I attended a couple months ago, while anticipating Max crossing Rainbow Bridge. The instructors were showing a slide presentation about how the pets in our lives have become so important, and how the pet industry finally woke up and took notice around 2000. They showed the statisics of households owning pets, and the money spent on those pets had increased over 200% since that time. Along with that, it was shown how the average life span of a cat or dog, sometimes spans through schooling, first and second careers and sadly longer than some marriages. This shows what an important part of our life pets have become, and why we mourn so when we lose them. But this ad, this ad, really shows how much our pets mean to us. Ok, to buy a car that focuses on the luxury of our pets? Do you notice there is nothing in this ad that shows any comforts for the driver and passenger? No heated seats, airbags, GPS, DVD player, Cruise control, ect. Well, I dont know that it doesnt have it, but I do know that is sure doesnt point any of that out. But I do know, as soon as I read this ad, my first thought.... I GOTTA HAVE IT (And I am not even a Honda person, nothing wrong with them, but just not one)!! Now, that just irks me, that I showed more interest in the dogs comfort than my own. I laughed out loud and shared with hubby how this ad is GREAT! If it got me, I know it will draw in those with unlimited pocket spending, to buy a new vehicle for their pet, even if they were not thinking of a new one currently. Now that is SMART advertising, I say! Oh wait.... I just read the small print: Package not intended for dogs larger than 80lbs. Well, that just saved my pocketbook! Wheewww... I was about ready to run out and buy one. **Added note** Last year, due to my lack of paying attention, I accidently flew us into the wrong airport on the home leg of a trip. Landing about an hour away from where our car was parked. We had to rent a car to get back to town. We ended up with a Chevy HHR. On the way home, we swung by to pick up our dogs from their pet sitter. Both our Danes fit very nicely in the back of that car, and it wasnt as high up to climb in. So I could see this car working too. Not intended for full sized doggies? Huh? 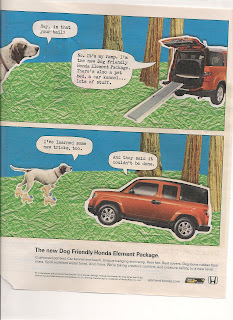 We have one of those Honda element things (without the dog friendly package). I like it because the side doors are easy to get in and out of and with the back seats removed there is plenty of space for my large and handsome self. I think you should get one! OMG that is brilliant except for the size issue... even Moose would not fit (though I bet he would)! I saw on the website there is a built in fan and waterbowl too! Now if only the airline industry to realize that my dog is not baggage and I would pay for a spot in the cabin if they offered it! I might fly more too! Wow! Thanks for sharing Mindy! I wonder if its coming out to Australia? You know we DID buy a car specifically for Mr Darcy! We thought we better get a wagon (because we had a sedan) and we thought we should get one that didn't use as much fuel. SO we did! But as it turned out Mr Darcy enjoyed the sedan so much more as he could sit his bottom on the seat, in between the kids and rest his head on the driver's shoulder!